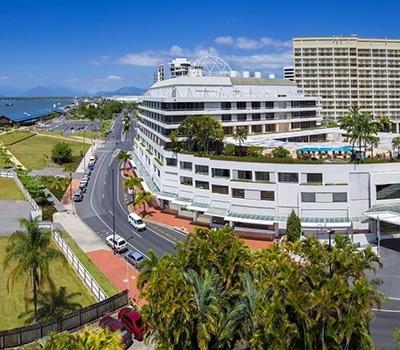 For more than two decades, The Reef Hotel Casino has provided great gaming in Cairns. With a respectable range of table and electronic games, the boutique casino is popular with locals and visitors alike. Gamblers of all skill levels and budgets will feel at home at the boutique casino, but that's just a small slice of the action in and around The Reef. The property is home to excellent eateries, bars, a luxury hotel, and the famous Cairns ZOOM and Wildlife Dome. Whether you live in North Queensland or are a tourist taking in the majestic Great Barrier Reef, The Reef Hotel Casino deserves a spot on your itinerary. Despite its modest size compared to the casinos in Sydney and Melbourne, The Reef Hotel Casino is a great place to play roulette. Unlike most gambling venues in Australia, The Reef lets you enjoy European roulette even at modest stakes. That means you can take advantage of the single zero version of the game and its superior odds even if you only feel like betting a couple dollars at a time. Of course, you are entirely free to raise the stakes. One of the great things about The Reef is that you can enjoy two different styles of European roulette. You'll find standard tables hosted by friendly croupiers, who are more than happy to show you how to play if you are a beginner. Yet you can also enjoy rapid roulette, which is a great alternative no matter what your skill level happens to be. Rather than fight for a spot at a table, rapid roulette gives you your own terminal. You'll be able to place your bets using the convenience of a touch screen before the host spins the roulette wheel. As the name implies the games are much quicker than traditional forms of a game. It's a great alternative if you're looking to play with greater comfort and don't feel like repeatedly counting your chips just to know where you stand. If you prefer playing in a more intimate environment, you'll want to visit Club Privé. The VIP gaming room welcomes local and international players to play roulette, blackjack, and baccarat at higher stakes. VIPs can take advantage of complimentary food and beverages, as well as plenty of personal attention, but you'll need to be a member to walk through the doors. Fortunately, membership is free to qualifying players. The Reef has an impressive selection of games for a boutique casino. Besides roulette, players can choose from blackjack, mini as well as midi baccarat, sic bo, paradise pontoon, keno, reef routine, and money wheel action. If you prefer electronic games, you'll appreciate the selection of over 500 gaming machines including progressive pokies. With games starting at just a cent, anyone can afford more than a little fun. Poker fans won't have to sit on the sidelines. You'll find Texas Hold'em tournaments every Thursday through Sunday in the Casino Sports Arena. Like most gambling destinations, The Reef offers a loyalty program. When you join Reef Rewards you'll earn points whenever you enjoy electronic games. Unlike more complicated schemes found elsewhere, Reef Rewards lets you convert your point to cash. 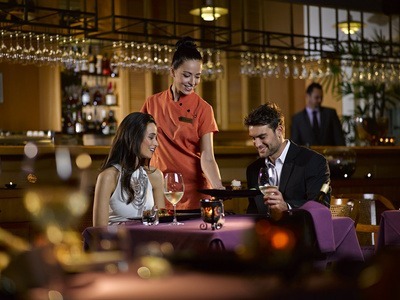 Members can also get discount on meals, drinks, and accommodation too. The Reef Hotel Casino has excellent promos, especially for a casino of its size. You'll find plenty of draws for cash, cars, and other prizes. There's great offers just about every night of the week. The Reef offers excellent restaurants and bars. Tamarind, the property's signature restaurant, is famous for its seven course tasting menu, but you'll also find delectable a la carte entrees like Penang duck curry, roasted eye fillet, and smoke local reef fish. Flinders Bar & Grill cooks up everything from breakfast to top sirloin. If you're craving Hong Kong or Peking cuisine, Café China is always exquisite. Whether you are looking to watch the match, dance until the break of dawn, nurse a couple cocktails, or make some new friends, you'll find 4 great bars on site. 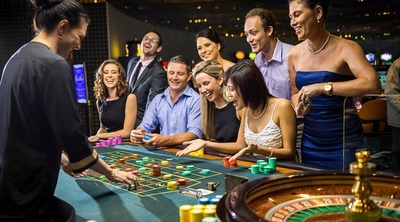 Besides Flinders, you can choose from Casino Sports Arena Bar, Vertigo Cocktail Bar & Lounge, and Lihou Bar, which is right on the gaming floor. The Reef Hotel Casino is easily the best place to stay in Cairns. The property boasts 128 luxury units, ranging from spacious superior rooms to the expansive presidential suite. Whether you opt for a view of the water or cityscape, you'll appreciate easy access to your own private garden terrace. Don't forget to take advantage of the gym, sauna, and glorious rooftop pool. The best part is that the rates are surprisingly affordable, especially given the famous high level of service. That means more cash to hit the tables without compromising your comfort. The casino offers plenty of live music, karaoke nights, dance parties, and tribute shows. The dinner & show packages are particularly popular. Although the retro dance club has shut down, management has something special planned for the space. When it comes to entertainment, nothing beats the Cairn Wildlife Dome. Get up close and personal with lorikeets, cockatoos, parrots, wallabies, frogs, and more in this cross between a live nature exhibit and a test of your physical fitness. The Reef Hotel Casino accepts a whole host of Australian-friendly banking options. These include Visa, Mastercard, Maestro, PayPal, POLi, Neteller, Ukash, ClickandBuy, and many more.